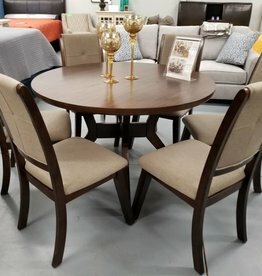 Barney Table w/ 6 dining rooms. Chair Color: Upholstered Cocoa Brown. Table measures 48'' Dia. 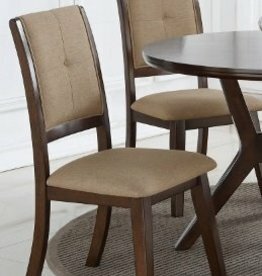 x 30'' H. Chairs measure 18.8'' x 17.3''x 38'' H.
Barney Table w/ 4 dining rooms. Chair Color: Upholstered Cocoa Brown. Table measures 48'' Dia. 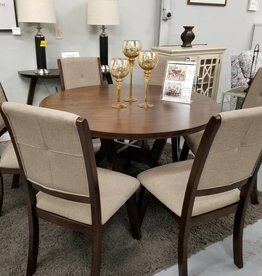 x 30'' H. Chairs measure 18.8'' x 17.3''x 38'' H.
The Barney Chairs measure 18.8'' x 17.3'' x 38'' H. The price is per chair but chairs must be ordered in pairs.